You will need to log in with your university username and password to access the services in Digimap. You can do this by clicking on the Login Button at the top right of the Digimap home page. Register your details with Digimap. Accept the licence agreements associated with each Collection. If you need any help with the registration process please see the Registering for Digimap page. The EDINA Digimap Service is an on-line service that provides access to a variety of maps and geospatial data covering Great Britain. 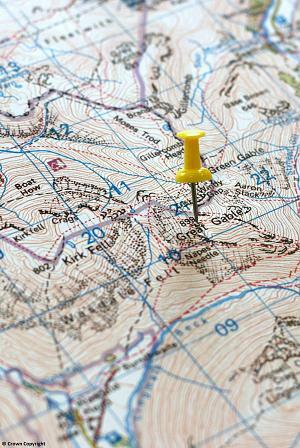 Ordnance Survey lets you view and annotate OS maps and print them at user defined scales onto paper sizes up to A0. You can also download multiple OS data products for use in GIS/CAD. all available National Grid maps at 1:1,250, 1:2,500 and 1:10560/10,000 scales published from 1945 and before the introduction of the OS digital mapping. Geology allows you to view, create and annotate geological maps and download data to CAD/GIS. Marine offers a range of hydrographic map and data products, including Admiralty Charts, from SeaZone. Environment brings easy access to Land Cover data from the Centre for Ecology and Hydrology. Aerial offers 25cm resolution vertical aerial photography from Getmapping – the most detailed national coverage available. Lidar gives access to digital terrain, surface model and point cloud data, plus additional vertical aerial imagery including near infra-red and night time imagery. The Map Librarian is the University’s Digimap Site Representative. Contact the Map Librarian for advice about using Digimap or if you would like a demonstration of the service. If you are a member of academic staff then you can contact the Map Librarian to arrange a Digimap induction session for a class in your department.